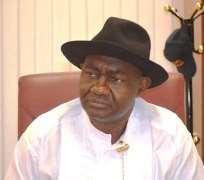 The Senator representing Rivers South-East Senatorial District in the National Assembly, Magnus Ngei Abe has said that no one can handpick a Governor for Rivers State. The right to do so, Abe said rests squarely on the shoulders of Rivers people to freely choose who will lead them. Abe who spoke at the funeral service of late Pa Macdonald Graham Harry, father of Dr. Ipalibo Harry, Federal Commissioner, National Population Commission, held at Saint Alban's Anglican Church Obuama, Degema Local Government Area of the State. The Senator further said that the election was not only an embarrassment to the country but unacceptable even as he wondered why people have failed to learn from the past. "All across the country, you could see that the people tried to vote. They also tried to count their votes but in Rivers State, the reverse was the case, because it is obvious that we did not learn from what happened in the 2015 general elections and draw our lessons appropriately. "I'll like to appeal to Rivers people not to leave the future of our State in the hands of the politicians alone. This State belongs to all of us and no one man owns more or deserves more of Rivers State than others. "I was very clear when I called on our supporters in the State to vote for a candidate of their choice in the governorship election and not to vote for the governorship candidate of African Action Congress (AAC) because it was an attempt by Rotimi Amaechi to single-handedly handpick a governor for Rivers people and he cannot. "That is the decision that all Rivers people have as a right to freely participate in a process to elect whoever will govern the State”.